An incredible blend of power and versatility, the MC205 delivers all the explosive dynamics required by today's demanding high-performance home theater systems. Dynamic Power Manager (DPM), an exclusive McIntosh technology, insures top performance at 8 and 4 ohms, enabling the MC205 to deliver 200 watts per channel into a wide variety of loudspeakers. McIntosh amplifiers, whether two-channel or multi-channel designs, are known for smooth, non-fatiguing sound, and the MC205 is no exception. Distortion remains below 0.005% across the entire 20-20,000 audio band at full power. Noise levels are vanishingly low, and five balanced (XLR) input connections help prevent noise pickup in connecting cables from degrading the amplifier's low noise advantages. Amplifier Power 200W min. (stereo) or 500W min. mono continuous average power output from 20Hz to 20kHz. THD Maximum Total Harmonic Distortion at any power level from 250 milliwatts to rated power output is 0.005%. With a total of 1400 watts of power, the MC207 delivers all the explosive dynamics that high-performance home theater systems require. What's more, by incorporating McIntosh's Dynamic Power Management (DPM)TM circuit topology, the MC207 delivers full power into a wide variety of loudspeaker types. 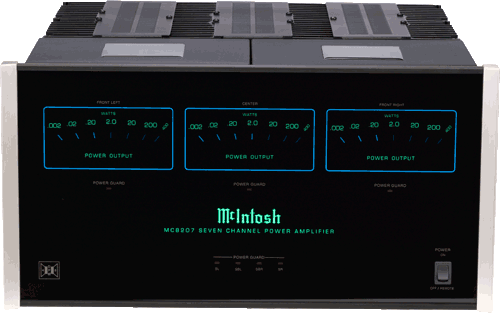 McIntosh amplifiers, whether two-channel or multi-channel designs, are known for smooth, non-fatiguing sound, and the MC207 is no exception. Distortion remains below 0.005% across the entire 20-20,000 audio band at full power. Noise levels are vanishingly low, and seven balanced (XLR) input connections help prevent noise pickup in connecting cables from degrading the amplifier's low noise advantages. Why should you buy a McIntosh amplifier? 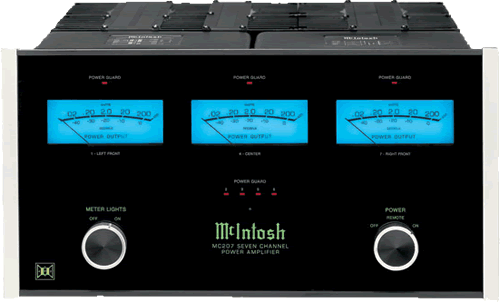 McIntosh amplifiers are designed to sound better and last longer than any other amplifier. They are beautifully hand crafted, using the best materials from a manufacturer that has been creating some of the finest audio equipment in the USA in Binghamton New York! power output from 20Hz to 20kHz. MC8207 is a 7 channel amplifier designed to power the finest home theater systems. Seven channels may be used in larger rooms or five channels for the theater plus two stereo channels for powering a set of speakers in another area of the home. 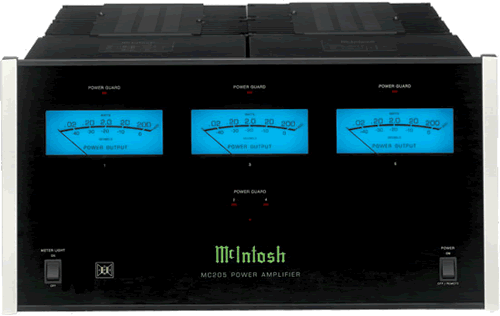 Immensely powerful, the high current MC8207 delivers 200 watts per channel into either 4 or 8 ohm speaker types using the McIntosh Dynamic Power Manager. You will always have all the power you need when using MC8207.